Firefighters were called to the scene of a fire this morning at One World Trade Center in New York. NBCNews.com's Dara Brown reports. Updated at 1:15 p.m. ET: Smoke that was reported on the 88th floor of One World Trade Center in Lower Manhattan on Wednesday morning was from welding work and not an actual blaze, the Fire Department of New York said. A civilian reported smoke just before 7:45 a.m. When firefighters arrived, they could see smoke coming from the 88th floor, FDNY Battalion Chief Kevin Brennan told NBC News. Firefighters arrived and encountered crews doing welding work, which caused the smoke to be visible from outside the building. The equipment was being used as intended, and there was no actual fire, according to officials. About 12 workers were on the floor at the time, and no one was injured. The Port Authority called the incident "a false alarm." One World Trade Center, the giant monolith being built to replace the twin towers destroyed in the Sept. 11 attacks, laid claim to the title of New York City's tallest skyscraper on April 30. Workers erected steel columns that made its unfinished skeleton a little over 1,250 feet high, just enough to peak over the roof of the observation deck on the Empire State Building. The building is still under construction. NBCNewYork.com, NBC News and The Associated Press contributed to this report. 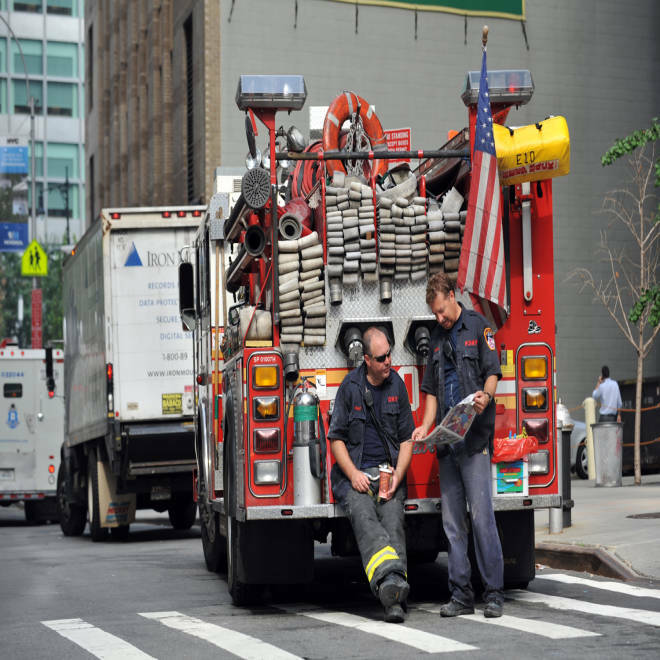 New York firefighters read a newspaper after responding to reports of a fire at the One World Trade Center tower Wednesday in New York. Are nuns getting ready to spurn the Vatican?